We recently wrote an article for the purpose of selling a home "off the beaten path" for the purpose of creating online conversation about the home. The interaction, sharing, and conversations it created about the home were more than we had hoped for. There are millions of homes for sale in the United States right now, so creating a marketing piece with the intent of having it generate viral results takes some effort. Face it, cute cat videos and stupid pet tricks (while wildly popular for some reason) do not get people talking about a home that is being marketed for sale (of course, if you can think of a way to do this, please leave the idea in the comments below, we'll likely give it a shot). Because it is so difficult, you will rarely see a viral marketing video that was created to draw exposure to a specific home. Well, we've been studying digital marketing longer than anybody else in the Tallahassee real estate market, and we occasionally pull a rabbit out of the hat for our sellers. People who do not understand marketing are typically the first to proclaim a marketing program as successful or unsuccessful. Even though they are not in the market to buy a home or sell a home, and even though they know nothing of how to sell a home, they are quick to comment on a thought provoking picture. These "self proclaimed experts" are actually the backbone of our viral marketing. Why? Because unlike what you might or might not assume, the old adage that "any press is good press" is absolutely true when selling a home. They will comment and share the marketing piece to their friends, who will also comment and share it among their friends. The whole concept of "viral" is that once written and lightly promoted, the marketing piece will spread through various networks across the internet. The more "phenomenal" the image, the better it will spread. Whether positive or negative, it is very likely that "everybody" in the market to buy a home will eventually here about it. 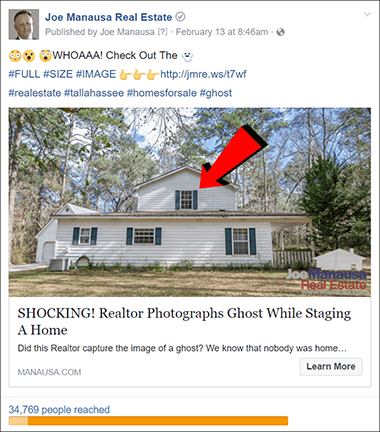 As a case in point, we recently promoted a home with a blog post exclaiming "SHOCKING! Realtor Photographs Ghost While Staging A Home." In its first ten days, the article was read by more than 6,000. Our promotion on Facebook (see image on the right) was viewed by nearly 35,000 through last Friday (you can check here to see how many more have been reached by now). The fact is, more people have seen this home in its first ten days on the market than any other in the Tallahassee MLS, and it's all due to our deliberate viral marketing campaign. Viral marketing is not easy, it takes many hours of daily promotion to get a marketing piece to develop legs of its own, and perhaps that is why you seldom see its use in our industry. This is the part of marketing that non-marketing people seldom grasp. We need to get people who are in the market (or will soon enter the market) to know about a home for sale. Often times, when buyers use online property search tools, they accidentally eliminate homes that would be perfect for their needs. By creating a blog post and using social media to generate a viral impact, we use the online community to help spread the word that a home is for sale. What we have found among "ready" buyers who are very aware of inventory who discover a home which has a negative issue, they'll still want to see it. And if the home is truly a great value, it means no other home on the market is "better." The home will stand on its merits, and more people will be considering a purchase then would occur when most people do not even know it is on the market. All homes have negative issues, but serious buyers have serious opinions when decision time rolls around, and ready-buyers rarely make decisions in the manner that the self-appointed "experts" claim they would make. As far as "haunted" being a negative, can you really see this conversation occurring between a wife and a husband. "Gosh, it's the largest home, on the largest lot with great trees, and it has all the bedrooms and amenities that we want, and it's even priced below the competition. Even though the home is perfect for us, I guess we'll move on because I saw an image that somebody claimed to show a ghost in the house." Now there will be plenty of people thinking "why would they tell everybody there is a ghost in the house," ... now you know. It helps create conversation about a great home for sale in Northeast Tallahassee. Our experience tells us that this will spread the news better than any other method and perhaps we can locate multiple buyers who will end up bidding against each other to buyer the home. 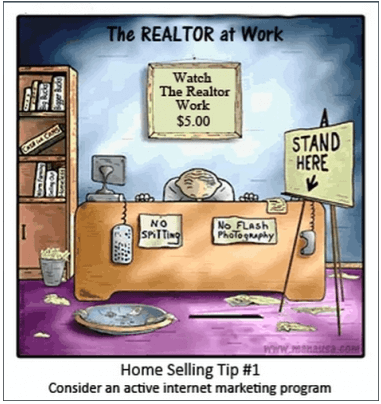 If you are planning on selling a home, interview several agents, and have them show you examples on the internet where they are doing more to promote their listings than everybody else. It doesn't matter how many websites you are on, it matters if people are engaging with other and your home is the topic of discussion. If you'd like to see several examples of this, just check out our Facebook page. We have more interaction going on there than any other real estate agent or company in North Florida. An active real estate agent produces content daily for the purpose of driving prospective buyers to the company listings. Don't fall for a bunch of talk when somebody says they'll syndicate your listing to thousands of other websites. I think we all do that! But who is producing the content that will help you gain a viral reaction to your home?